It's incredibly cold and frosty right now. The sun blazes briefly upon rising, then settles into a pale, aqueous reflection of its earlier glory. (Although today it's firmly hidden by a grey sky!) It's the sort of weather that makes us all think it's going to snow, and indeed it has elsewhere, but thus far, here in Oxford, we've only had one light overnight dusting, sparser than icing sugar covering a cake. And there's a child in each of us which would love it to snow, which longs to play and build snowmen and come in, covered in melting ice, to mugs of hot chocolate. There's an inner poet, too, which dreams of the eerie beauty, pearly light and muffled silence of a landscape, park or even a side street transformed by layers of this magical white powder. But alas, poets and children are encased within adults, and instead we dread the inevitable travel disruption and worry about frozen pipes and slipping and sliding on icy pavements. 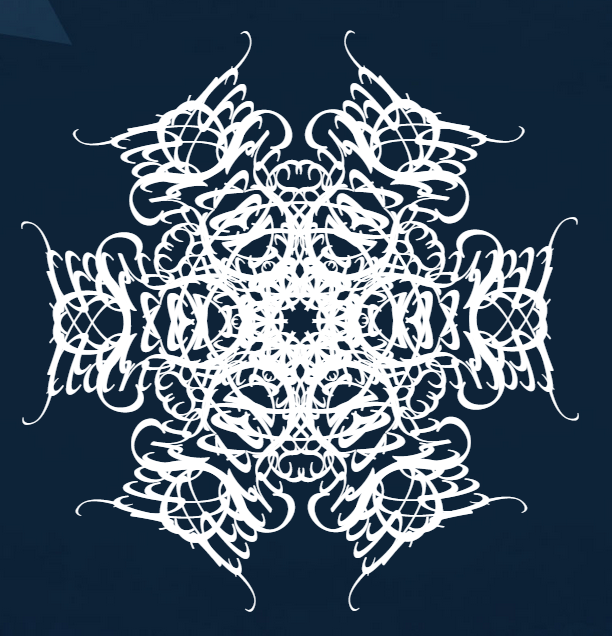 But we can still enjoy some snowy fun, thanks to a website I came across shortly before Christmas, which transforms your name into a rather lovely snowflake. It's great fun, especially if you can play around with middle, maiden or nicknames, adding and subtracting, inflating or deflating with just a few letters. I started with Silvana, which produced something elegantly curly but somewhat sparse, and gradually built up layer upon intricate layer. My favourite result is below, as is the link to the website. So, whether you're dreaming of a white January, or fed up with trudging through drifts of snow and slush every day, why not treat yourself to a bit of creative playfulness, and make yourself a snowflake name...? Ah, yet another source of displacement activity! I've already spent far too long playing with it when I've other things to do... But it's wonderful, and fun. How did you manage to save the image of your snowflake? I took a screenshot, then cropped the image. Enjoy a bit more displacement!